Labor Day offers the ideal time during which your business can recognize its employees for all the hard work they’ve completed throughout the year. Companies should be sure to host a themed event to celebrate both consumers and staff members during this holiday, giving them the opportunity to revel in fun company and receive spoils pertaining to your brand. The holiday falls on Sept. 1 this year, so consider holding your celebration on Friday, Aug. 22, or the following Tuesday after your employees return from the long weekend. If you’re searching for ideas to honor your workers, consider throwing one of the following bashes. While Labor Day presents an opportunity for workers to relax, it also ushers in the unofficial beginning of the fall season. By this time, schools are back in session and parents have returned to their daily grind. Offer your employees one last glimpse of summer, throwing a bye-bye summer bash to finally bid adieu to the warmer season. 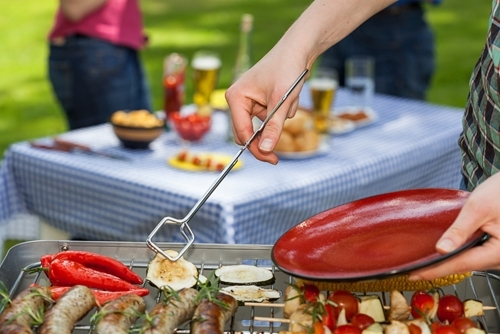 Break out the BBQ and treat visitors to hot dogs, burgers and vegetables fresh from the grill. To show gratitude to your attendees, don’t forget to distribute promotional products at the end of the day. For an event such as this, business owners have two solid options for promotional giveaways. If you’re expecting a sizeable crowd, set up a registration station where visitors can enter their name for the chance to win an exciting prize. Sticking with the spoils of summer, choose a high-quality gift option any consumer could enjoy. For example, the Custom BBQ 11 Piece Set would supplement your celebration well, as it not only proudly displays your brand name, but it encourages your consumers to host a BBQ of their own. In addition to handing out a larger prize attendees could win from a raffle, be sure to distribute smaller items throughout the day that your visitors could enjoy. Families with small children may enjoy a fun item like the Promotional Funny Hand Clapper, which could keep them entertained throughout the event. Older attendees, however, may prefer a more practical item, like a 16 Oz. Promotional Econo Double Wall Tumbler. Instead of saying goodbye to summer, your business may prefer to host a celebration that welcomes the crisp conditions brought by fall. Consider an outdoor event that takes place in the evening, as it will allow your visitors to enjoy the cooler weather that occurs after the sun goes down. One exciting option for this type of celebration would be to host your own drive-in movie event. First, you’ll need to set a location – if your business has a large parking lot that it can receive permission to use, be sure to take advantage of that space. If not, consider renting out or visiting a drive-in theater with your staff members. Alternatively, your company could rent a projector and screen (a large white sheet would do the trick) and set up shop in a public park or large space. After determining where the event will take place, invite employees to the spot to enjoy a festive evening of film, friends and fun. Be sure to pick a family-friendly flick, as you’ll want your workers to bring as many friends as possible. Depending on the time of the film, you may want to provide dinner or popcorn for your employees. You’ll also want to distribute promotional items that will serve them well during the autumn months. The Promotional Econo Blanket is ideal, as it will not only keep your visitors warm during the event, but it can be easily carried from location to location, further increasing your brand’s presence in the public.